The big news of the day happened off the court and likely behind closed doors in a room with paintings of men who have been dead for over 100 years as Maryland is headed to the Big Ten after its Board of Regents approved the move and Rutgers is expected to join suit later today. Obviously these moves are driven by football-generated television revenue, but it is unfortunate how this move will negatively affect some current college basketball rivalries, particularly Maryland-Duke. The decision to invite Rutgers, a school that has largely been irrelevant in revenue-generating sports, appears to be motivated by its proximity to New York City and the huge television market that comes with it. Our writers at the Big Ten microsite have already provided an overview of how these moves will affect the Big Ten, and the ACC microsite has chimed in as well, but for our part the loss of Maryland as a charter member of the ACC is one of the sadder stories of the entire conference realignment era and we wonder how Terps fans will take to their new conference. Nobody with half a brain these days still thinks that schools give much, if any, consideration to their student-athletes, fans or sentiment to longstanding and traditional rivalries when making these purely financial decisions to chase the highest possible payout. This mindset is perfectly laid out by ESPN.com‘s Dana O’Neil, who with a scathing edge to her pen, writes: “The landscape is a storm-ravaged mess and the last idealistic fan has left the building, seeing this entire enterprise for the sausage-making caper it is. College sports are gaining money and losing credibility, the sham of amateurism and purity reserved merely for the athletes and their vow of poverty.” Pat Forde follows her with a missive describing how Maryland and Rutgers’ incompetence both on the fields of play and in the boardroom are virtually meaningless in modern realignment calculus. What does matter: “Location, location, location [near major media markets]. That’s what this latest round of conference realignment is about.” Both are absolutely correct, of course — in just the last year we’ve lost (or will lose) Missouri-Kansas, Syracuse-Georgetown, and now Duke-Maryland. All in the name of more dollars. At what point do those dollars level off when fans realize that Rutgers-Michigan or Maryland-Iowa simply doesn’t have quite the same passion and intensity surrounding it? Wednesday’s game between Kentucky and Morehead State was supposed to be a nice homecoming for former Wildcat star Sean Woods (you may remember him as the guy who hit the shot before Laettner hit The Shot). It may not turn out to be so friendly, though, after a story was published in the Louisville Courier-Journal in which Woods criticized the current Wildcats for their sense of youthful entitlement. Perhaps as the result of some harsh local feedback, Woods backed off his earlier statements via his official Twitter account. We are guessing that Woods’ clarification will be enough for most Wildcat fans — his banner hangs in the Rupp Arena rafters, after all — but there will probably be a few of the less reasonable ones who use it as an excuse to create a minor scene on Wednesday night. While the Hall of Fame Tip-Off Tournament has been able to bring in big name programs the past two years — Kentucky (2011) and Ohio State (2012) — it has failed to draw large crowds even when Big Blue Nation invaded Mohegan Sun last season with an absolutely loaded team. Now the organizers are trying to overcome that with a 2013 field that includes two powerhouses — North Carolina and Louisville — as well Richmond, Belmont, and a group of four local schools. Having been to the event once we would be surprised if even the presence of these two schools could make up for the odd atmosphere surrounding the arena and casino, but it should at least make for a better televised final. Along the same lines, the Maui Invitational announced its field for the 2014 tournament (two years from now), and it includes the following eight schools: Arizona, BYU, Missouri, Purdue, Pittsburgh, San Diego State, Kansas State, Chaminade. It’s not the strongest Maui event we’ve ever seen, but we’d expect at least three of those teams to rank in the Top 25 that season, perhaps more. Speaking of the Garden Isle, we don’t typically discuss game results in this space, but on the 30th anniversary of Chaminade‘s historic upset over #1 Virginia in 1982, we thought it was too coincidental to fail to mention the Silverswords’ 86-73 victory over Texas on Monday night. Certainly there are failures in the comparison — first of all, Texas 2012 is not Virginia 1982. The Longhorns aren’t even ranked, and they are playing in Maui without their best player, Myck Kabongo, in the lineup. Secondly, the gap between Division I and Division II basketball isn’t what it was 30 years ago — better training methodologies and techniques at all levels of basketball have helped, but the regular gutting of high-D-I hoops by the NBA creates situations like at Texas where Rick Barnes faces a rebuild every couple of years (Ralph Sampson would have without question been one-and-one in today’s environment). Still, it’s pretty cool. Texas has by far the nation’s top athletic department budget (last check: over $150 million) and it’s unlikely that Chaminade even surpasses a cool million. Could the D-II darlings use a home court advantage to take down Illinois tonight — nobody knows the answer, but it’s stories like these that answers the question of why we watch the games. 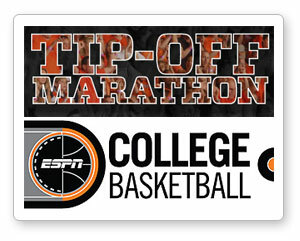 The ESPN 24-hour Tip-Off Marathon starts at midnight tonight. If you are a bored college student, a chronic insomniac, or a college basketball blogger, you may be planning on making a run at the ridiculous, meaning staying up for the entire event. While we can’t officially tell you that this is a good idea and recommend that you go ahead and do it, we don’t blame you, either. It’s a great event. We wish all the decision-makers could organize it so that this “Tip-Off Marathon” actually was a tip-off to the season, but even though it doesn’t really tip anything off, it’s still a blast. You’ll get an early edge on your hoops-loving friends and sound ever-so-insightful as you talk intelligently in late November about mid-majors your buddies and bud-ettes won’t even plan on watching until Championship Week. Of course, even if you don’t remember, say, that power forward from Northern Iowa who really caught fire, or why Rider’s man-to-man defense impressed you, you’ll still have the memory of watching as these teams and their fans all got together and did something…well, really bizarre. And you never know; someday ESPN might decide to feature your school for the 4 AM ET game, and you’d want people to watch, too, right? Most importantly, though, once you’ve made it through an entire 24-hour marathon, nobody can take it away from you. ESPN has held the event three times, now, and RTC’s John Stevens has stayed up for all three and live-blogged each of them. He rides around town like some college basketball version of General Patton, with his front license plate bearing three gold stars on a red background, one for each marathon he’s survived. And we won’t even get into the matter of those ivory-handled revolvers; that’s another story altogether. Eccentricities aside, John has a few useful tips for you if you’re headsworn on showing you’re at least as much of a man as Andy Katz by going the distance. I used to have a job that, once or twice a week, required me to stay up for anywhere from 24 to 35 consecutive hours. Because I knew when those were coming, I could plan accordingly. I knew what to bring with me to the job to help pass the time, and my family and friends knew not to expect me to answer the phone (or my door, after it was over and I was sleeping) or meet them for a night out, or whatever. In other words, the earlier you can get all your preparations done and get into the spirit of this thing, the better it will go for you. You need to get your supermarket trip done immediately — seriously, as in right after you’re done reading this — if you haven’t already. Don’t get into a spot where you’re watching Drexel at Rider (6 AM ET) or Morehead State at College of Charleston (8 AM) and you suddenly find that you’ve run out of Sun Chips or Chee-tos or whatever your bagged fuel of choice is. Now you’re screwed, unless you have friends who will bail you out by bringing you provisions. Play it safe, here. Always get a little more at the supermarket than you think you’ll need. You may have thought that after last summer’s seismic shifts of conference realignment (or the threat of it) involving nearly all of the major conferences, we’d have an uneventful offseason in that regard this year. So far, that’s generally been true. With the the moves pending at Nebraska, Utah, Colorado, BYU, Boise State, Fresno State, Nevada and TCU, and the television dollars already in place for the new Pac-12 and Texas/ESPN deals, it’s generally been all quiet on the realignment front this year. The ridiculous incentives and free-for-all mentality that drove last year’s posturing and maneuvering among the major players of the sport have now settled; but at the lower levels of Division-I basketball, the party never ends. 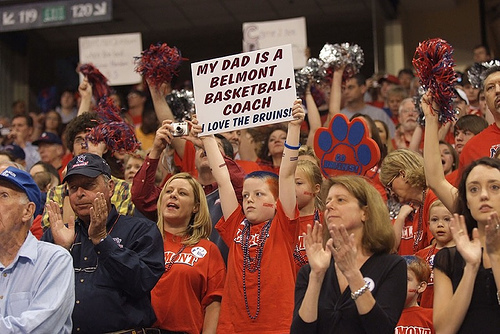 Schools are always looking for ways to upgrade from one conference to another, and Friday’s announcement that Belmont University will switch from the Atlantic Sun to the Ohio Valley Conference beginning in 2012 should surprise nobody. The driving force behind this move is, what else, money. Belmont, located in Nashville, is in the northwestern hinterlands of the A-Sun’s footprint, a league that stretches from Tennessee east into the Carolinas and all the way down to south Florida. The OVC, on the other hand, is clustered in Tennessee and Kentucky, with the majority of its schools located within a couple-hour drive of Nashville. As Belmont AD Mike Strickland noted, the school stands to save at least a quarter-million dollars a year on travel costs alone. Even with the $200,000 buyout required to leave the Atlantic Sun, the program expects to have that cost more than covered in its first year within the OVC. While we certainly understand the financial incentives and the better “fit” aspect of this move, we’re not as convinced as to the benefit to Rick Byrd’s basketball program. The Bruins have made four of the last six NCAA Tournaments out of the A-Sun, and it will be joining a top-heavy OVC led by Murray State, Austin Peay and Morehead State. The problem is that even with the inclusion of Belmont into the Ohio Valley, the league is still going to be a one-bid conference, so it appears to us that Belmont’s move will only make it more difficult for the school to earn its way into the Big Dance. In a comment relating to the move, Byrd stated that Belmont will now have a “one in twelve” shot to make the NCAAs, whereas it was “one in nine” in the A-Sun — notwithstanding the probability error inherent in his analysis, why would viewing your odds of going dancing as less likely ever be a good thing? Byrd’s team will bring back nearly everyone from a 30-5 (19-1 A-Sun) team that made the NCAA Tournament in 2010-11, losing to Wisconsin, 72-58, in the Second Round. The methodical ball-control style of Bo Ryan’s Badgers was a bad matchup for the Bruins, but they’re already getting some buzz as a team to watch next season. As you’re well aware, the OVC’s Morehead State upset Louisville last season, and Murray State knocked out Vanderbilt the season before, yet despite Belmont’s considerable hype, Rick Byrd’s program is still awaiting its first-ever NCAA Tournament win. As a final encore in a league they’ve owned the better part of the last half-decade, perhaps 2011-12 will be the year, serving notice to its future OVC brethren that their treasured automatic bid will be significantly tougher to secure in the future. Saturday promises to be a great day of matchups in the Third Round of the NCAA Tournament. On paper at least, there isn’t a single one of the eight scheduled games that shouldn’t be competitive. #4 Kentucky vs. #5 West Virginia – East Region Third Round (at Tampa, FL) – 12:15 pm ET on CBS. At first glance, West Virginia would appear to match up fairly well with Kentucky. The Mountaineers employ two fifth-year seniors while Kentucky trots out three freshmen in their slim rotation. Bob Huggins is 7-1 all-time against John Calipari, including last year’s Elite Eight triumph over the top-seeded Wildcats. The frontline of Kentucky, featuring only one consistent rebounding presence in Josh Harrellson, would seem to match up poorly against the assembly line of Mountaineer forwards and centers that finished sixth in the nation in offensive rebounding percentage. The reason we think Kentucky bucks this conventional wisdom is twofold: 1) a predominantly young Kentucky team may have discarded of their lackluster performance in the first round when they secretly felt showing up would be enough to defeat Princeton, and 2) the Wildcats are much more adept against a zone defense than they were last season because of the shooting ability of Brandon Knight and Doron Lamb. A key factor in West Virginia’s win over Clemson in the first round was the changing defenses Bob Huggins showed the Tigers, including a 2-3 and a 1-3-1 zone at various instances. Kentucky is eleventh overall in the nation in three-point percentage at just under 40% as a team and we think Knight will be on the board a lot earlier than the final offensive play of the game this time around. Kentucky simply has much more offensive firepower than West Virginia, who will have to out-tough, out-physical and out-rebound the Wildcats to advance to the Sweet Sixteen. John Calipari’s teams never receive enough credit for being solid defensively. Against a WVU offense that shoots just 48% from two and 34% from three, we believe Kentucky’s efforts on both ends of the floor will be sufficient. The RTC Certified Pick: Kentucky. #2 Florida vs. #7 UCLA – Southeast Region Third Round (at Tampa, FL) – 2:45 pm ET on CBS. The Gators stomped all over UC Santa Barbara on Thursday while UCLA narrowly avoided what would have been an epic implosion, holding off Michigan State after nearly blowing all of a 23-point lead with under nine minutes to play. Aside from a couple of losses to Kentucky down the stretch, Florida has been playing great basketball coming into this tournament and it continued in their first NCAA game. To advance to the Sweet Sixteen, Florida has to stick to what they do best, scoring inside while knocking down some timely threes. The Gators have the height to match up with the turnover-prone UCLA forwards and should also enjoy an edge in the backcourt with a much better team three point percentage behind Erving Walker, as well as Kenny Boynton when he’s hot. The Bruins turned the ball over 16 times against Michigan State and a similar performance will result in plenty of fast break points and extra opportunities for the Gators. UCLA’s strength is up front, both offensively and defensively, but Florida can match the height and depth of the Bruins’ frontcourt. Reeves Nelson and Tyler Honeycutt need to have solid games for UCLA to be in the game down the stretch, otherwise Vernon Macklin and Chandler Parsons could take over on the boards and in the paint. These two teams are similarly constructed but the Gators have had more consistent guard play, especially from Walker. This is a really good matchup for Florida, in our opinion, and the Gators should advance from Tampa to the regional semifinals. The RTC Certified Pick: Florida. #12 Richmond vs. #13 Morehead State – Southwest Region Third Round (at Denver, CO) – 5:15 pm ET on CBS. In yesterday’s interview session, Morehead State guard Terrance Hill referred to getting to the Sweet Sixteen as a goal for his team all season, “like Butler did last year.” And his statement personified just how important this game is to non-BCS schools like Richmond and MSU — by winning one more game and advancing to the regional semifinals, it’s roughly equivalent in terms of status and prestige to a major program like Duke or Kentucky making the Final Four. Given the fact that for both schools a power conference bully isn’t standing in their way to the regionals, neither wants to give an inch in pursuing the opportunity. Still, even though Richmond isn’t a BCS school, they are a member of a high-mid league and Chris Mooney has a corps of four seniors in Kevin Anderson, Justin Harper, Dan Geriot and Kevin Smith who have been to consecutive NCAA Tournaments and have won ninety games in the last four years. The offensive options available to Mooney are significantly better than those at the disposal of Morehead’s Donnie Tyndall, and it’s unlikely that the Spiders will be as careless with the ball as Louisville was on Thursday afternoon. While Kenneth Faried is likely to pull down twenty rebounds against the slight Richmond front line, the Spider perimeter players are very good at locking down the opposing three-ball, holding opponents to a mere 30.5% (Morehead nailed nine, including the game winner, against Louisville). Furthermore, MSU isn’t very good at stopping the three on their end, as Louisville was able to knock down ten, and UR, led by Anderson (42.7%), Harper (46.5%) and Darien Brothers (39.7%) makes a living as a team in bombing away. With a trip to the Sweet Sixteen on the line, the smart money is on the team that isn’t as likely to have celebrated too hard — Morehead State won the biggest game in its history on Thursday; Richmond beat Vandy. Who would you choose? The RTC Certified Pick: Richmond. Now that the Play-In First Four games are finished, let’s get back to normalcy with the best weekend of the year beginning this afternoon. Sixteen games, eight sites, four television channels, and several million brackets busted by roughly 3:30 PM eastern time. Expect a low-scoring, gritty and physical opener for Thursday’s NCAA Tournament action, and not just because the tip time is barely after noon and Clemson arrived in Tampa just before the sun came up on Wednesday. Both of these teams pride themselves in their toughness defensively and play extremely hard on every possession. Clemson specializes in limiting opposing offenses inside the arc behind senior forward Jerai Grant prowess in the paint, while West Virginia limits their competition to below 30% shooting from the three-point line. While both Brad Brownell and Bob Huggins have a history of trotting out stalwart defenses, the edge offensively has to side with the Mountaineers. Kevin Jones has been playing his best basketball of the season as of late, posting three double-doubles in his last four outings. Casey Mitchell is a 38% gunner from deep that is tremendous off screens in catch and shoot situations where he barely needs any room to fire. Deniz Kilicli and John Flowers have aided what has turned out to be the sixth best offensive rebounding team in the nation, no surprise coming from a Huggins-coached squad. Clemson is merely middle of the pack in Division I in allowing offensive rebounds, so the Mountaineer frontline may be able to churn out extra possessions for their perimeter weapons throughout this game. Limiting Grant is certainly a challenge, but the WV frontline should be up to the task. Combine tired legs with Mitchell feasting on a perimeter defense that just surrendered 12 threes to UAB and the edge in this 5/12 matchup has to side with the Mountaineers. The RTC Certified Pick: West Virginia. #8 Butler vs. #9 Old Dominion – Southeast Region Second Round (at Washington, D.C.) – 12:40 pm ET on truTV. Both teams have won their past nine games en route to conference tournament championships. Defense has been the key for each club during their winning streaks with Butler giving up 58 PPG and ODU at 57.7 PPG against over their last nine games. Old Dominion is one of the best rebounding teams in the nation and that is where they have to take advantage of the Bulldogs. This game will be played almost exclusively in the half court with both teams preferring a slower pace. Butler ranks #11 in defensive rebounding percentage but the Monarchs are the best offensive rebounding team in the land. Blaine Taylor’s team must win this battle and protect the basketball in order to advance. They struggle at times with turnovers and lots of giveaways will negate their expected edge on the glass. Look for the Monarchs to work inside utilizing star big man Frank Hassell as well as Keyon Carter and Kent Bazemore. Butler allows 48.7% FG inside the arc and that could hurt them against the frontcourt-oriented Monarchs. Butler shoots almost 21 threes per game behind Shelvin Mack, Zach Hahn and even Matt Howard (44%). Add in the recent play of Shawn Vanzant and you have a team playing as well as they have all year. ODU is very poor against the three, their biggest vulnerability. Bazemore is a terrific defender and needs to come up big on that end against the Bulldog guards. Both teams are experienced and obviously did well in last year’s tournament so they won’t be intimidated by the big stage. While the focus will be on Howard vs. Hassell in the post, this game could be determined by guard play. 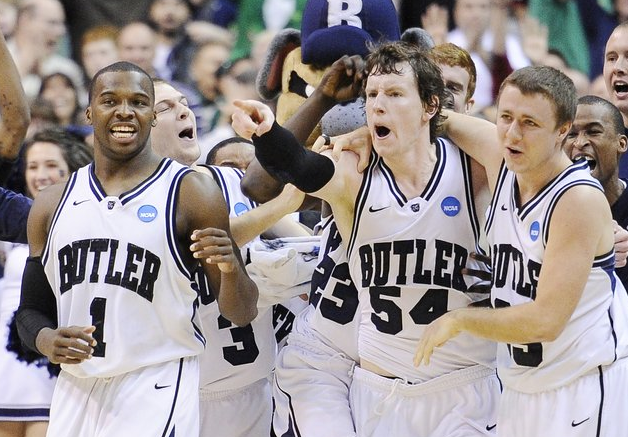 The RTC Certified Pick: Butler. #4 Louisville vs. #13 Morehead State – Southwest Region Second Round (at Denver, CO) – 1:40 pm ET on TBS. We’re quite sure that Louisville head coach Rick Pitino could only shake his head in disgust when he saw his team’s opening matchup on Thursday. An in-state mid-major whose greatest strength — a dominant glass-eater by the name of Kenneth Faried — bears stark contrast with his Cards’ greatest weakness, interior play. Over the years, Pitino has mastered the art of using team defensive principles to stymie players like Faried by throwing two and three bodies at him everywhere on the floor. The Cards will need to again, because Faried’s nonstop motor and Rodman-esque knack for finding the ball is the best in the nation (he corrals 20% of offensive rebounds and 31% of defensive rebounds while he’s on the floor), something his players know all too well after facing Morehead State (and Faried) in the same round two seasons ago (Faried went for 14/11 in a 20-point loss). He’s gotten better, and so has his team. The good news for Pitino is that MSU is often sloppy with the ball, committing nearly fifteen turnovers a game, and the Eagles don’t defend the three very well (36.9%), which will allow ample opportunities for the Louisville shooters to get good looks from deep. Two seasons ago a stronger Louisville team went into halftime only up two points on a weaker Morehead State team; expect a similar situation this year, as the relative strengths and weaknesses offset each other. Ultimately, the Cards will find enough points through hustle and desire to fend off the school located two hours east, but we’ll forgive Pitino if he lambastes the committee for giving him this dangerous opponent for the second time in three years. The RTC Certified Pick: Louisville. #7 Temple vs. #10 Penn State – West Region Second Round (at Tucson, AZ) – 2:10 pm ET on TNT. While the Owls are 25-7 and the higher seed here, this is not a team that is at full strength. They have played their last eight games without center Michael Eric, who will not return this year, and the last seven without swingman Scootie Randall, who is holding out hope that he will be able to go Thursday. The Nittany Lions, meanwhile, are at full strength, but their full strength means that their five starters are ready to play a whole lot of minutes, with only sporadic contributions from the bench, which averages less than eight total points per game. And given the pace at which Penn State plays (their games average just 60 possessions, in the bottom two percent of the nation), a pace which Temple will have little objection to, we’ll have a low-scoring, limited possession, defensive battle that will likely come down to seeing which of the two teams makes the most plays in the final few minutes. Because of that, the Lions may have the edge. Not only do they have four seniors amongst their five main players, but Talor Battle is an explosive scorer given the limited number of possessions he works with. And, among their five man rotation, only Andrew Jones is a poor free throw shooter. For Temple to counteract the experience of the Lions, they’ll need to get plenty of inside production from physical freak Lavoy Allen, while perimeter players like Ramone Moore, Khalif Wyatt and point guard Juan Fernandez will have to take advantage of a PSU defense that likes to pack it in and force their opponents to beat them with their jump shot. Unfortunately for the Owls, even if Randall does make it back for this game, their most efficient offensive player does not figure to have his legs back, and Temple may come up a bit short. That’s Debatable is back for another year of expert opinions, ridiculous assertions and general know-it-all-itude. Remember, kids, there are no stupid answers, just stupid people. We’ll try to do one of these each week during the season. We’re fairly discerning around here, but if you want to be included, send us an email with your take telling us why at rushthecourt@yahoo.com. This Week’s Topic: Many of the small conferences are starting their tournaments this week. Which one do you find the most compelling in terms of the possibility of upsets and/or creating chaos for the NCAA Selection Committee in a little over a week? Also, pick a relatively unknown team that you’d like to see make a run through their conference tourney so that America will get to watch them play on the big stage in March Madness. I think the Horizon League Tournament is the small conference tournament that is the most compelling in terms of creating chaos for the NCAA Selection Committee. In my mind, Butler, Cleveland State, and Milwaukee are the only teams that have the capability of winning the tournament. If Butler loses (which is very possible), it will be very interesting to see how the committee will view the Bulldogs’ resume. I tend to believe that Cleveland State will win the Horizon League championship because they have the best player in the league on their team in senior guard Norris Cole. I would enjoy to see the Vikings make a run to the Horizon League championship and shake things up in the tournament like they did when they were a #13 seed and upset #4 seed Wake Forest two seasons ago. With Cole, I think this is very possible for Gary Waters’ Cleveland State squad. I’ll take the Colonial. You’ve got six 20-win teams out of twelve, and you’ve got to figure George Mason has a bid locked up with Old Dominion looking good, as well. Let’s say someone like Drexel (a 20-9 team with a resume that includes a win at Louisville, mind you) gets hot and wins this thing. Could we be looking at a four-bid year for the Colonial, with James Madison or VCU sneaking in as a function of the soft bubble this year? And how can you not root for William & Mary, a team that’s never been to the NCAA Tournament, after the fantastic case they made for at-large inclusion last year? As far as a team I’d like to see make a run, I’ll go with Morehead State. It wouldn’t be much of a run, of course, since as a 2-seed they earned that weird double-bye in the OVC Tournament and only need to win two games (same situation as 1-seed Murray State) to claim the title. But the world needs to see Kenneth Faried play at this level one more time. He and the Eagles won a preliminary round game in 2009 before getting cooked by 1-seed Louisville, and two NCAA Tournament games for the Fabulous Faried just doesn’t seem like enough. Vermont won the America East Conference by one game and rightfully earned the top seed in the tournament by avoiding slip-ups against the league’s lower-tier teams. You’ll want to keep an eye on this tourney, though, because Vermont hasn’t exactly faired well against the top of the AE. Second-seeded Boston University swept Vermont this year, including an overtime win Sunday. And the third seed, Maine, routed the Catamounts on their home floor back in January. The Black Bears, a preseason favorite, have since collapsed and lost seven of eight games to finish the season. Regardless, either team could still pose a threat to Vermont’s NCAA tourney hopes at some point during the next week. For sympathy’s sake, I’d like to see Weber State win the Big Sky this March and pluck a spot in the Big Dance. How can you not feel bad for this program? Two years ago, the Wildcats ripped through the league with a 15-1 record but slipped to the NIT. Last year, Anthony Johnson’s legendary performance helped Montana stun the regular season champs again. Finally, 2010-11 appeared to be “The Year,” with two-time POY Damian Lillard returning for his senior year. Naturally, he broke his foot and played just 10 games this year, and he’ll now wait on the status of a medical redshirt. It’d be nice to see the third-seeded Wildcats win three games for their tragic hero. 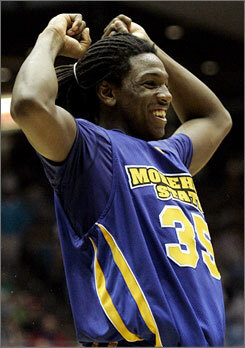 This is a story about Kenneth Faried and Morehead State. I know that it’s March now, and that Morehead State, who went 13-5 in the Ohio Valley Conference, has only the slightest chances of making a tournament splash. We have all March to talk about the contenders and the Big Dance. For now, let’s talk about Kenneth Faried and Morehead State. Actually, first let’s set the stage. We are very good at measuring offense in basketball. We have a good sense of what is valuable and how much impact a player can make on the offensive end. The box score stats provide enough of a jumping-off point that a few bits of mathematical transformation can paint a pretty clear picture of a team or player’s impact on the offensive end. We’re talking about offensive efficiency, as good a tool as we have in college basketball. It’s so good, in fact, that we like to cheat and use opponent offensive efficiency to measure defensive efficiency, which is a pretty clever little trick. By measuring how opponents perform against a given team on average, we have some measure of that team’s defensive abilities. The operative word here, however, is “team.” While we can tell how well a team performs by measuring their opponents foibles on offense, how do we assign individual credit? Not every player defends equally, and while I wouldn’t argue that defense isn’t a team effort, surely some players have a clear measurable defensive value over others. Defensive efficiency tells us very little about this. Of course, maybe I was getting ahead of myself by plunging into advanced stats before just checking out the box score. Steals, blocks and defensive rebounds are all individually counted categories that suggest defensive aptitude, and indeed, after converting these categories into their tempo-free counterparts, we have a pretty good suggestion of players with specific defensive abilities. There are, however, problems with these categories. A block where an opponent retains possession really doesn’t do much good, yet those blocks are counted just the same as those that trigger fast-break opportunities. Steals generate extra possessions, but failed gambles for steals can lead to high-percentage shots. The example with steals highlights the bigger problem of what isn’t captured by the box score, namely, how good a player is at making the man he is guarding miss shots. Now, manual defensive charting and a thorough parsing of play-by-play data might be able to produce a pretty good individual opponent field goal percentage ranking, but so far, accurate and comprehensive data of this sort is just not available to us. Note: For our BGTD coverage from Saturday, please see these three posts examining the early games, the late afternoon/evening games, and the BracketBuster games. Your Watercooler Moment. 1, 2, 3, 4… The last time that the top four teams in the national polls lost in the same week of action, Barack Obama was an unknown state senator in Illinois and Saddam Hussein was hiding in a hole in somebody’s backyard. It was November 2003, and the names Bieber, Gaga and Twitter had no meaning to anybody yet, but UConn, Duke, Michigan State and Arizona each dropped a game over Thanksgiving week that year and the result was a significant re-ordering of the poll. The big difference this time around is that we’re two weeks from the end of the season as opposed to two weeks from the start, so the likelihood of four established teams dropping games over the same week was far more unlikely. So what happened, exactly? We already knew that #1 Kansas lost to K-State in rough-and-tumble fashion last Monday. But the next three teams waited until the weekend to join the polling bloodbath. It began on Saturday with the first game of the day — Steve Lavin’s rejuvenated and tough-as-nails St. John’s program took down #4 Pittsburgh on the back of Dwight Hardy’s 19 points and his tap dance routine along the baseline to win the game. It was the cherry on top of the sundae in a season of breakthroughs for the Red Storm program, and as you can see below, Madison Square Garden has become something more than just the place where Amare and (now) Melo play. A little later Saturday afternoon, #2 Texas was in trouble at Nebraska late when its vaunted defense and some brain-farts on the part of the Huskers led to a ridiculous 12-1 in a span of thirty-four seconds to tie the game in the final minute, 65-all. What appeared to be a major meltdown in Lincoln, though, turned to bedlam as Doc Sadler’s team regained its composure enough to hit their FTs down the stretch and notch possibly their biggest win in years. UT is more than its individuals, but when Jordan Hamilton struggles as he did on Saturday (3-16 FG), the Horns have trouble putting enough points on the board against quality teams. With the win, Nebraska has vaulted itself back onto the bubble — with a favorable schedule down the stretch, the Huskers could potentially get back into the NCAA Tournament for the first time in thirteen seasons. Nice RTC, fellas. On Sunday it was Ohio State’s turn to again do battle with a Big Ten road crowd and team dead set on knocking off the much-hyped Buckeyes. Purdue’s E’Twaun Moore ensured that the home crowd got what they paid for, as the senior guard went Kemba/Jimmer on the Big Ten leaders, scoring in just about every possible way en route to a superb 38/4/5 asst afternoon on 13-18 shooting. His 13-point stretch over the last three-plus minutes of the first half was as impressive an offensive display as we’ve seen all season, punctuated by an acrobatic circus shot layup (see below) that told the viewers that this was going to be his game. Talk has increased about Purdue as a legitimate Final Four contender after wins over OSU and Wisconsin last week, but the Boilermakers are an excellent home team. We’re not as sold on Matt Painter’s team outside the friendly confines of Mackey Arena. There you have it. Three of the top four losing over the weekend, and nobody having a clue as to how to rank the top six today. The AP Poll had six different teams receiving #1 votes, while the ESPN/Coaches had five. Even the RTC poll, consisting of only six voters, had four different teams ranked at the top. The takeaway from this weekend, and really, much of the season, is that there are a bunch of really good teams but certainly no great ones. The NCAA Tournament could look a lot more like the 1997 (Arizona), 2003 (Syracuse), or 2006 (Florida) versions given this season’s continuing and obvious level of parity. Your Watercooler Moment, Pt. II. Another Diatribe From Jim Boeheim. Syracuse head coach Jim Boeheim must really be frustrated with his team this season. The smiles and self-knowing mockery that he engaged with the media last season appears to have migrated south with the rest of the snowbirds. After tonight’s win (note we said “win”) at Villanova, Boeheim again lashed out at the media for its stupid questions and representations about his team. Mike Miller at MSNBC has the goods here (via Soft Pretzel Logic), and we’re a little bit at a loss ourselves as to why Boeheim is acting like such a prima donna lately. With respect to the questions about “toughening” up one’s team, he can choose to not believe in such a thing but we dare say that he probably does. Most coaches who have been doing this for as long as he has would probably believe there’s real team-building value in gutting out close wins ten times even if you end up losing a similarly-situated game in the postseason. We weren’t at the presser in Philadelphia tonight, but it sounded like someone arguing for the sake of being argumentative. Lighten up, Jim — the university pays you a LOT of money to answer a few minutes of questions after each game, not to berate people and make them feel stupid for doing their jobs.